My friend has a motorcycle; she has had it for about three years now. When her kids were smaller, they would ask for rides, but she wouldn't let them on with her until they were a little older. Taylor, a happy, well-adjusted first grader is now getting to ride the bike to school two days of the week during the nice days. 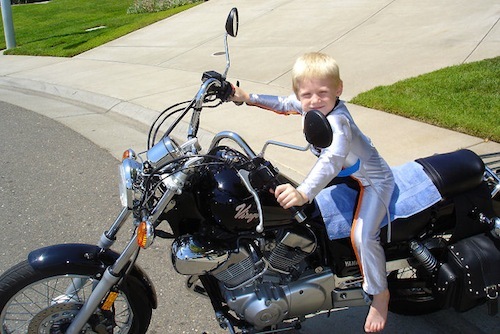 He loves riding the bike and he loves his mommy, so imagine her surprise when those two very things put her face to face with the first grade teacher's bad side. "My mom rides a motorcycle. She sold the clunker car that always broke down on her and bought this bike. She goes to work because Dad lost his job. He is going to school so that he can get a better job than the one that he had and he drives the minivan. I don't think you should have given me the frowny face on my paper, just because you don't know something (sic). You should have asked and I would have told you. See, sometimes teachers don't know everything either." I love that child and I can't wait until this teacher assigns him the task of drawing what he thinks of her.